Commercial kitchens are the workplaces (and playgrounds) of some of the most inventive people around. And they boast some of the best music on the planet. When your dinner reservation is still just a pencil mark in a ledger, long before the candle wicks burn, before the linen table cloths lose their creases and the cutlery lines up just so, your favorite restaurants fill up with great music. 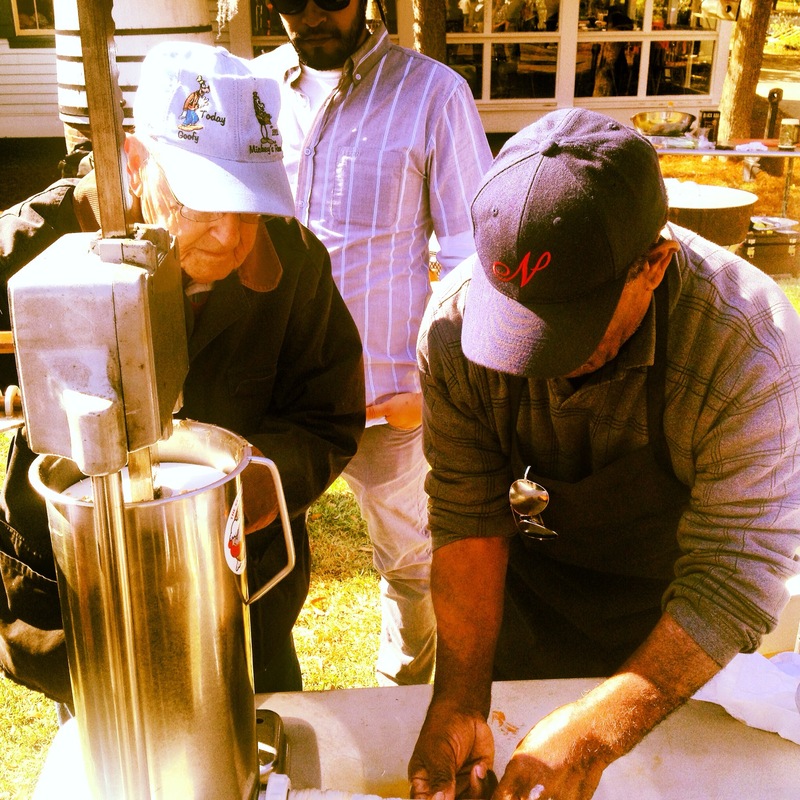 Rock ‘n’ roll, gut-bucket blues, country, funk, ska, and jazz make the food taste better because the chefs are listening. 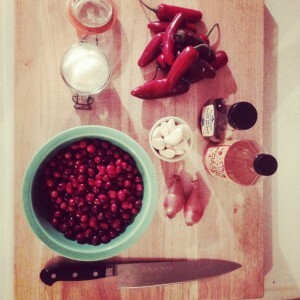 So, we’ve asked some of our favorite chefs to share a recipe with us and to pair it with the music they dig the most. What’s the perfect tune, for example, when you’re elbow-deep in offal? 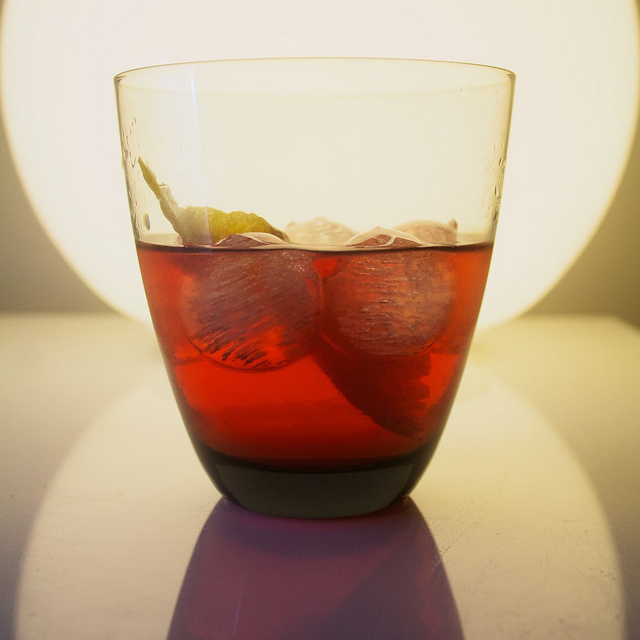 Music Inside Out is pleased to share the recipes and the music that goes with them. Let us know when you try a dish and we’ll pass the word on to the chef. Bon appétit and happy listening! Nathan Richard runs the charcuterie program at Restaurant R’evolution, the Cajun & Creole restaurant of Chefs John Folse and Rick Tramonto in the French Quarter. 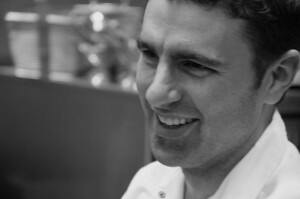 Richard butchers and then works his magic on all those delicious parts. We can also report that Nathan introduced Gwen Thompkins to moonshine, but that’s a story for another website. 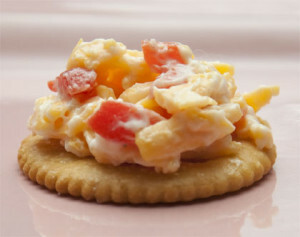 He gives us a staple of Southern hospitality: Pimiento Cheese, perfect for any cracker and a must for any (every?) party between now and… oh we dunno, the Super Bowl? When Ritz crackers go to snack heaven, this is exactly what they look like. Stir together first 7 ingredients in a large bowl; stir in cheese. Store in refrigerator up to 1 week. Josh Galliano is the Executive Chef at The Libertine in Saint Louis, but he comes by his praline fondness honestly: he grew up in the River Parishes of Louisiana. Josh received the Grand Diplome at Le Cordon Bleu London, then honed his skills and palate at some great restaurants, including Commander’s Palace in New Orleans and New York’s Restaurant Daniel. Josh has found an appreciative food community in Saint Louis that has rewarded him with a loyal following. And he’s picked up accolades such as Food and Wine’s Best New Chef: Midwest and multiple James Beard-Best Chef nominations. Servings depend on who’s eating it. Let’s say 4. For Galliano, it’d be 1. 1. Preheat an oven to 350 F. On a baking sheet tray, place a piece of aluminum foil that fits the entire tray. 2. Evenly place the pieces of sliced bacon on the tray, and make sure that none of the bacon overlaps. 3. Cook the bacon for 10 minutes. You do not want the bacon to be fully cooked; instead, the bacon should be about half way cooked with a good amount of fat rendered. 4. Remove the bacon from the oven, and allow to cool to room temperature. Before the bacon fat solidifies, pour the fat off of the sheet tray and reserve for another use. 5. In a food processor, combine the brown sugar and the pecan pieces, then pulverize. Remove the mixture from the food processor and reserve in an airtight container. 6. Distribute the pecan/sugar mixture over the top of the bacon slices, making sure to cover the tops of the bacon completely. This is not sprinkling on the mixture, but more of a packing the mixture on to the bacon. 7. Return the bacon to the oven and bake for 10 to 15 minutes, depending on your oven. You want the bacon to become crisp at this point, but not to have any of the nuts burn. Remove the bacon from the oven, and allow to cool for 3 minutes before transferring to a serving plate. Be careful, the bacon fat and the caramelized sugar can cause a severe burn at this point. 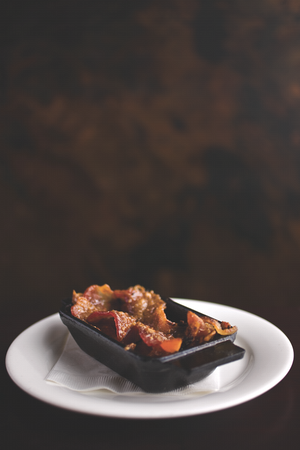 Josh writes: Since praline bacon makes me think of holidays around the River Parishes, I went with music that I grew up with because my Dad was always listening to great music. He grew up in New Orleans and played drums with a lot of the classic artists of New Orleans, and that was the music we listened to as kids. There isn’t really a reason behind any one of the songs, but there are moods about them that all spell out get-togethers and having fun. Alex McCrery has been a professional cook, a chef, a career food slinger, and an artiste for 17 years. He says he got his start washing dishes and frying taco shells in a Mexican joint in his hometown of Covington, Louisiana. Since then, he’s been around: Kansas City, New York City, and the Caribbean. He’s worked at the legendary Commander’s Palace, Charlie Palmer’s Aureole, and Antonucci. But the biggest honor, he says, has been cooking at the James Beard House. Nowadays, McCrery is the brains (and sometimes apron model) behind Tilit Chef Goods, a one-stop shop for aprons, hats, and bandanas. ‘Cause you can’t make pretty food if you look all a mess. 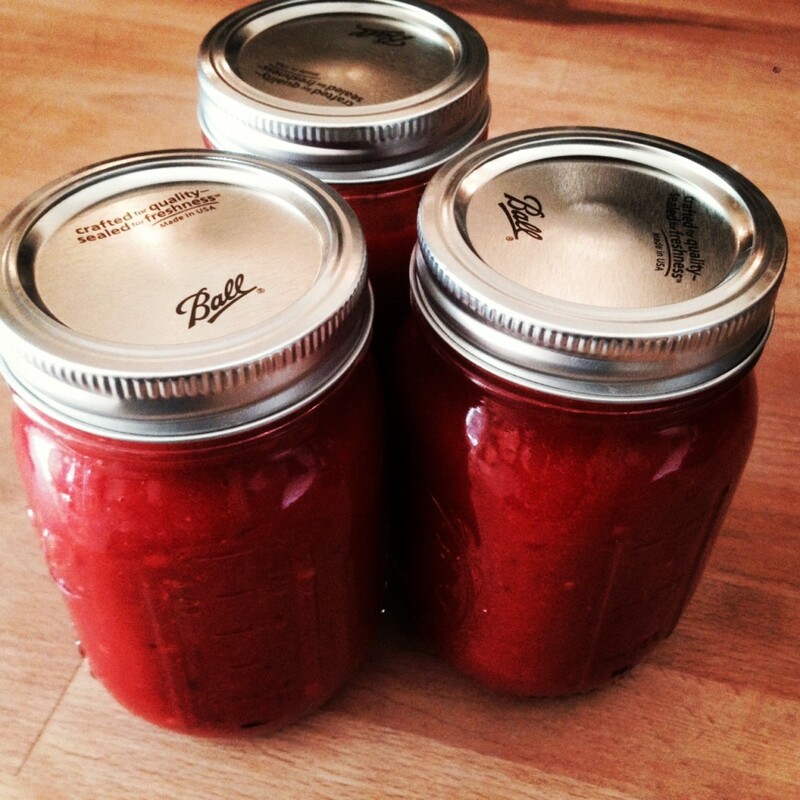 He’s shared a great take on a staple of Louisiana tables and purses everywhere: hot sauce. Simmer cranberries with water, agave, vinegar and salt for 45 minutes over med-low heat. Roast whole peppers (tops removed) with garlic and shallots wrapped in tin foil at 400 degrees for one hour. Chill everything together overnight. Blend until smooth the next day. Ryan Trimm has been all over the place. Born in Pittsburgh, he spent his childhood in Southern California, then his high school years in Memphis, where he now works. He went to Ole Miss and then went to Johnson and Wales University in Charleston, South Carolina. 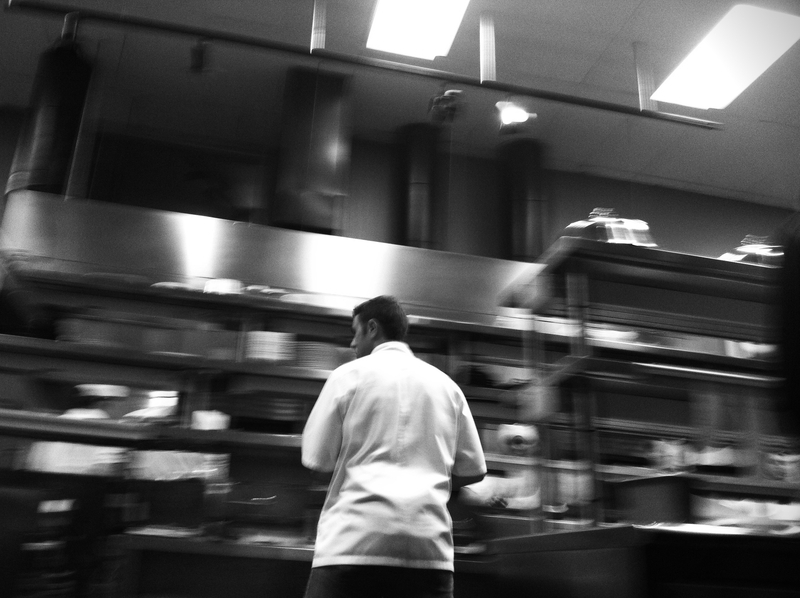 He found a job working under Chef Frank Lee at Slightly North of Broad. It was Ryan’s time at S.N.O.B. that he credits to honing his culinary skills. 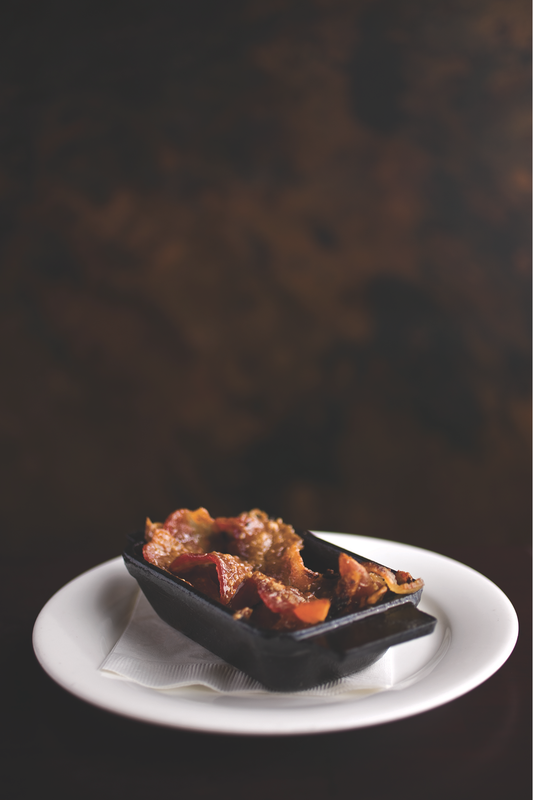 Trimm returned to Memphis in 2005 and worked at the Grove Grill as Chef de Cuisine. 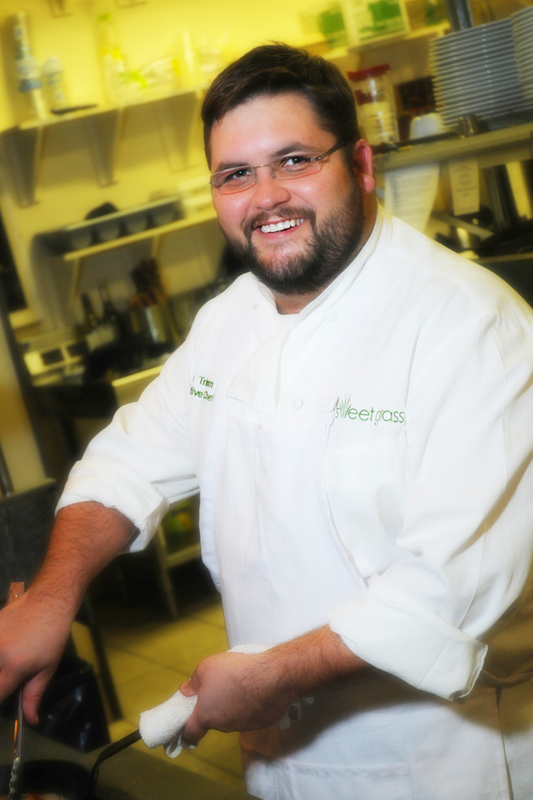 He and Glenn Hays opened Sweet Grass in 2010. 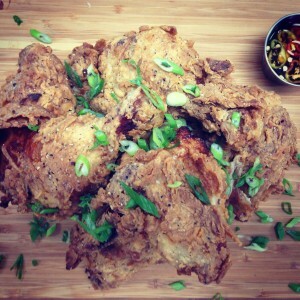 He shares a recipe for the ultimate family supper entrée: fried chicken. Quarter 1 whole bird and submerge in the brine. Allow to sit on brine over night. Remove chicken from brine, rinse and pat dry. Dredge the chicken through seasoned flour. Run the chicken through a bowl of regular All-purpose flour again. Lightly place the chicken in the fryer and fry until beautifully golden brown. I usually serve with fresh kale and Tabasco vinaigrette. 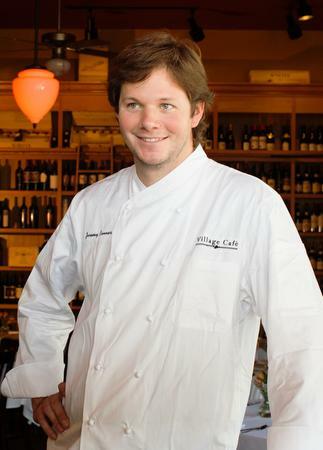 Jeremy Conner is the Executive Chef at Village Cafe in Lafayette, in the heart of Acadiana. He’s also a hell of a writer. Boil the chunks of pork shoulder in enough water to just cover them until they are tender, about 45 minutes. Add the chunks of liver to the pot and make sure there is enough water to cover, adding more to make up for evaporation. Continue to boil until the liver is thoroughly cooked. Remove the chunks of meat and liver and reserve the cooking liquid. Allow the meat and liver to cool slightly then mix with the chunked onions, celery, and peppers, the garlic cloves, the green onions, and the parsley leaves in a mixing bowl. 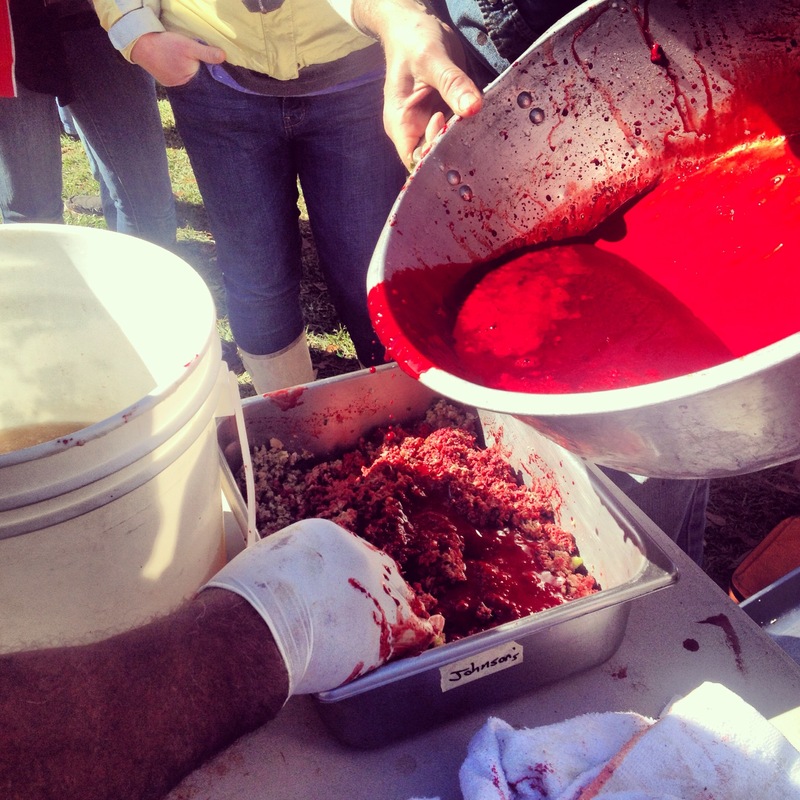 Pass this mixture through a meat grinder with a 1/4″ die. Place ground mixture in a mixing bowl and add seasonings except for salt. Taste and adjust the spice level to your taste. Add the cooked rice to the meat mixture. You are looking for a mixture that has ever so slightly more rice than meat. At this point you will add some of the stock left from cooking the meat and an equal amount of the blood. The amount to be added depends on many factors, but the end consistency is what’s important. The mixture should be bright red and very moist, but not wet. If you pick up some of the meat mixture with a slotted spoon, some blood/stock mixture should run through the spoon, but not a lot. At this point, take a spoonful of the mixture and cook it in a skillet. When it is done, taste it for saltiness. The blood, if whisked properly, contains a significant amount of salt, but probably not enough to adequately salt the entire mixture. Adjust as desired. 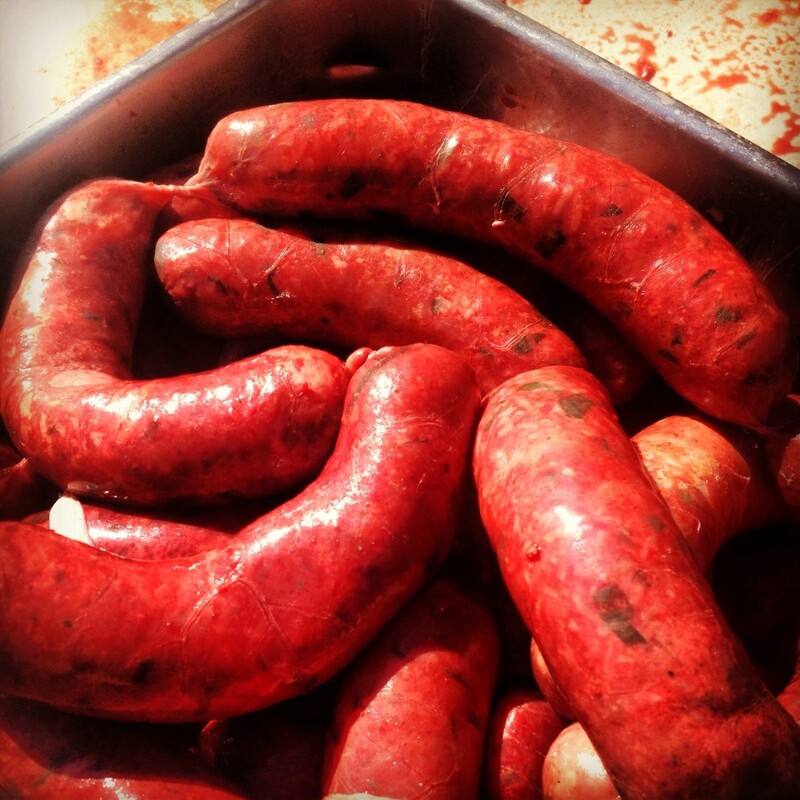 Place the rest of the mixture in a sausage stuffer and use the hog casings to stuff links. They can be short or long, but do not make rope sausage. The links will keep the amount of liquid consistent in each section of the sausage. Once all of the mixture is cased up, boil the links in the remaining stock from before until they are firm but not hard and they reach an internal temperature of 165. Remove the links from the pot and serve immediately or refrigerate for up to a couple of days, heating thoroughly before eating. 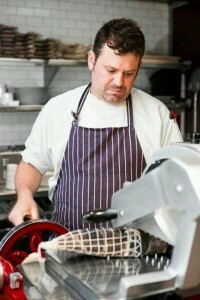 Born and raised in California, Justin Devillier moved to New Orleans in 2003 and cooked at Bacco, Stella, and Peristyle. While at Peristyle, he worked with Chef Anne Kearny-Sands and learned the intricacies of French cuisine. 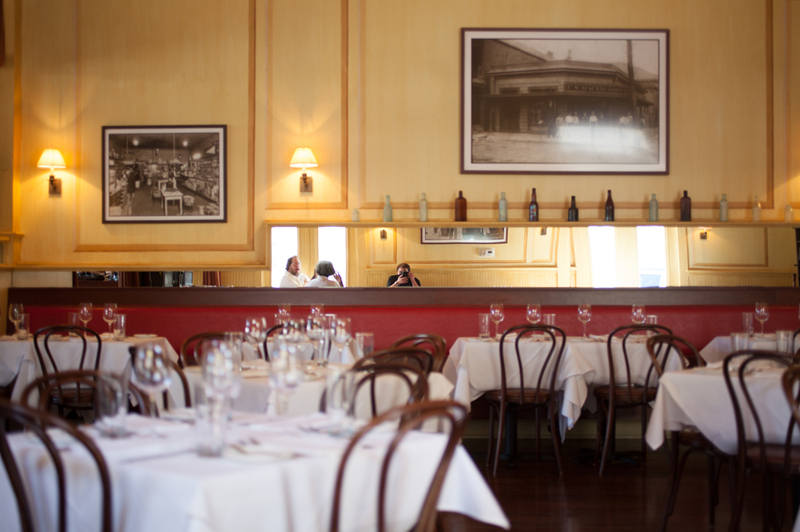 Devillier joined the La Petite Grocery team in 2004 and became sous chef a year later. After Hurricane Katrina, he helped re-build the restaurant’s infrastructure by managing daily specials and training the new line cooks. 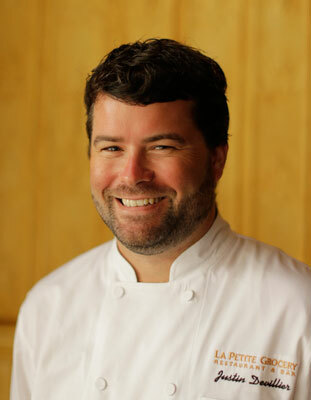 In February 2007, he was promoted to executive chef and named a 2008 “Chef to Watch” by Louisiana Cookin’ magazine and the Times-Picayune. 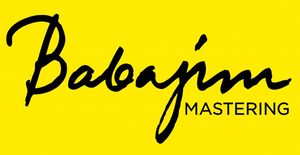 He and his wife Mia Freiberger-Devillier bought the restaurant in 2010. 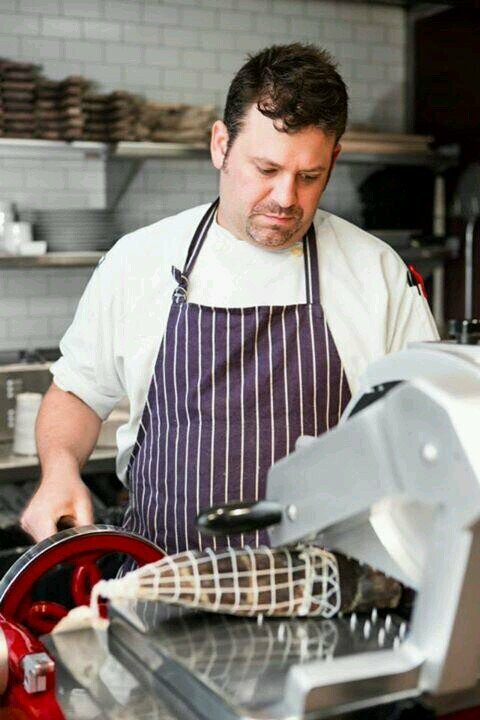 A two-time James Beard Award finalist, Justin is a contestant in the current season of Top Chef: New Orleans. Place all ingredients in a medium heavy bottomed pot and bring to a boil. Turn down the heat and simmer for one hour. Turn off heat and let the octopus cool in the poaching liquid. 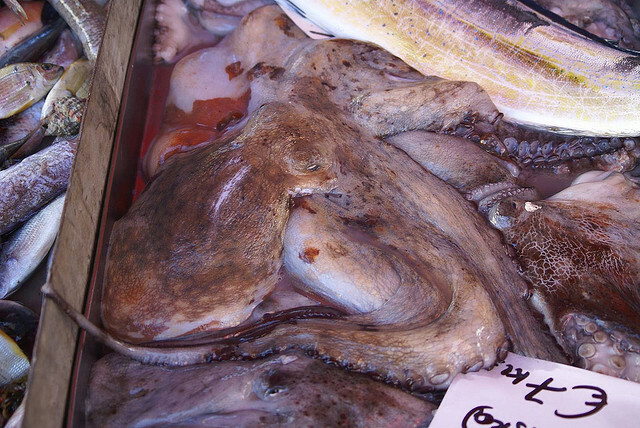 Remove the octopus and discard all other ingredients. Dry the octopus with towels and store in the refrigerator until use. Sweat the shallot and carrot in a sauté pan for 3 minutes. Add the lentils and two spoonfulls of chicken stock. Season with salt and pepper. Add the fresh herbs and taste for seasoning. Adjust acid with a squeeze of lemon. Render the bacon and drain off all the fat. Add the shallots and mushrooms to the bacon. Caramelize the aromatics for about ten minutes. Careful not to burn. Deglaze with red wine and add the thyme. Reduce to sec and add the veal glace. Reduce by 1/3 and strain through a chinoise. Return to pan and mount in the butter over medium heat. Season with salt and pepper. Char the Octopus on the grill until hot throughout. Place a spoonful of lentil mixture on the plate ad rest the octopus on top. Sauce with the bacon jus. 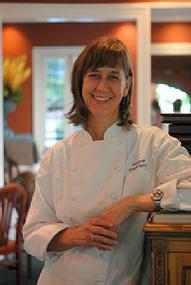 Susan Spicer, the chef-owner of Bayona, has been cooking in New Orleans since 1979. This pioneer of the slow food movement was a 2010 inductee to the James Beard Who’s Who of Food and Beverages. Her latest project is a casual, family-style restaurant — MONDO — in her Lakeview neighborhood, where she has lived for 20 years. 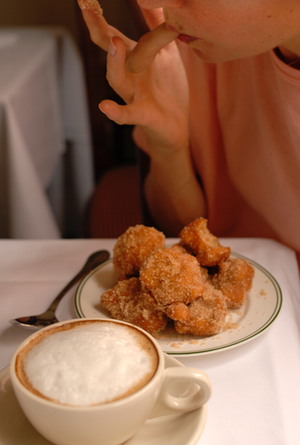 She shares a sweet treat: Banana Fritters. Sift the flour, baking powder, salt, sugar, cinnamon and nutmeg in a large bowl. Add the egg yolks and 1/3 cup of the milk, and stir to form a smooth paste. Stir in the remaining 1/3 cup milk and the corn oil. 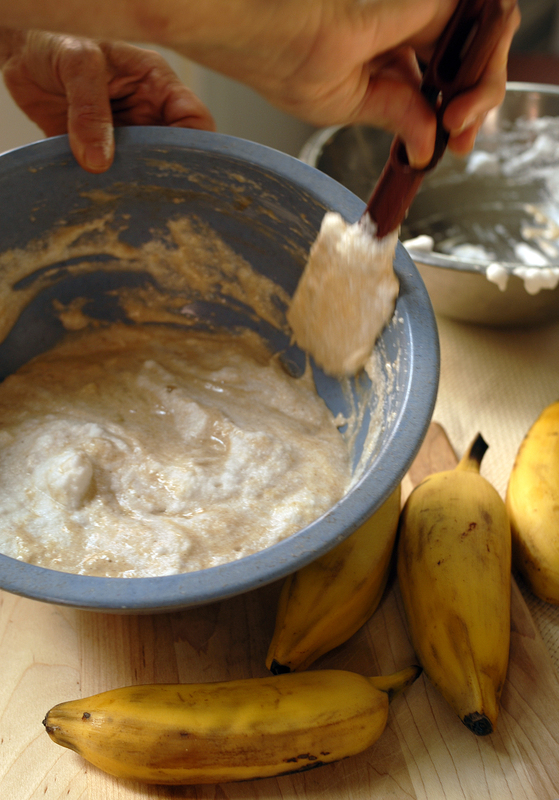 Add banana purée and dice, and mix until batter is smooth. Set aside to rest for 30 minutes. Beat the egg whites and the salt with an electric mixer (or by hand) until they form stiff peaks. Fold the whites into the batter. Fill a deep-fryer or a deep skillet with oil to a depth of 2 inches, and heat it to 375 F.
Drop spoonfuls of the batter into the oil and fry until well browned on both sides, 3-4 minutes. Drain fritters on paper towels and then roll in cinnamon sugar. Serve immediately. If I’m ever challenged to fight for — or maybe even die for — a spice, it would have to be well-worth my rotting carcass on the battlefield. Dammit, it would have to be something more than fine. The first time I had a rye and ginger cocktail was at the the Lost Love Lounge in New Orleans. It looks good in a glass, it goes down easily and I like to think it has the power to do a great deal of good in the world. I’ve made up half of the ingredients, but they work. All the proportions are to taste. For heaven’s sake, why aren’t you tasting by now? You can download (.pdf) all the recipes and a complete playlist here. Our thanks to all the chefs for their contributions.